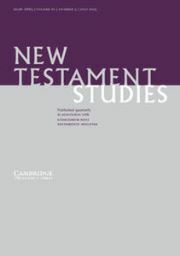 In April 2014, Harvard Theological Review devoted an issue to the discussion of The Gospel of Jesus' Wife, a fragmentary text thought by many to be a forgery. Regular readers of this blog will know that this fragment has been a hot topic of discussion since the first media reports of its existence in September 2012. (You can find the many NT Blog posts on the Gospel of Jesus' Wife here). Congratulations to the editor and the authors for their fine work on this volume, and thanks to Cambridge University Press for making it available free for all, just as they did just over a year ago with the HTR volume.